the 63rd Session of the United Nations General Assembly, Miguel d’Escoto Brockmann. Barlow founded the Blue Planet Project “to protect the world’s fresh water from the growing threats of trade and privatization”. She is the author of 16 books including her latest title Blue Covenant: The Global Water Crisis and the Coming Battle for the Right to Water as well as Blue Gold: The Battle Against Corporate Theft of the World’s Water. In 2005, she won the Right Livelihood Award (the alternative Nobel Prize). Dr. Caldicott the water crisis and mismanagement occurring in different parts of the world, particularly the fights in both the Third World and the First World against the privatization of water by large corporations. Barlow’s activism is focused on establishing the right to water as a basic human right in all societies, which she says all nation-states and the United Nations should mandate. She spoke in March at the Fifth World Water Forum, the proceedings of which can be accessed here. Read Blue Planet’s Preliminary Submission to the United Nations Human Rights Council RE: Decision 2/104: Human Rights and Access to Water. Also see A UN Convention on the Right to Water: An Idea Whose Time Has Come. Barlow explains how the world is running out of fresh water, and how we are creating deserts in many parts of the world because of the way we exploit the land and waste and pollute the water. She underlines that two billion people live in water-stressed areas. The poor do not have access to safe water, and Barlow describes how every 8 seconds, a child dies of a water-borne disease. Dirty water kills more children annually than AIDS and accidents combined. Groups like Global Water are working to create safe water supplies and sanitation in the developing world. For more on the big picture around water, see the reports World Water Development Report: Water in a Changing World and Climate Change and Water. Also read the article River systems worldwide are losing water due to global warming. Dr. Caldicott asks Barlow to comment on global warming and overpopulation, before they move on to talk about the enormous impact of water privatization. Dr. Caldicott says she is “shocked to my back teeth” that corporations would move into countries, buy the water supplies and then expect people to buy the water back. Barlow talks about the brutal battles around the world against companies such as the French transnational Suez Environment, which tried to privatize Argentina’s water, and how citizens have been victorious in some of these fights to protect their access to water. The U.S. firm Bechtel attempted to privatize the water in Bolivia as outlined in Bechtel vs. Bolivia: The People Win An International Trade Battle. Also see the report Bechtel’s Dry Run: Iraqis Suffer Water Crisis about how profit is the only motive Bechtel has for controlling Iraq’s water. In the U.S., Atlanta abandoned water privatization as described in No Silver Bullet: Water Privatization in Atlanta, Georgia – a Cautionary Tale. The World Bank, as well as Kofi Annan of the United Nations, to their discredit, have advocated water privatization. For more background, see Public Citizen’s Water for All Campaign Web site and their pages Water Privatization Overview and ABCs of Water Privatization. Also see the report Water Privatization Fiascos: Broken Promises and Social Turmoil and read the article Is the Water Privatization Trend Ending? Water privatization also results in job loss. Read the May 20 press release, New Food & Water Watch Study Reveals Privatized Water Systems Result in Job Losses and read the study here. Barlow and Dr. Caldicott mention bottled water. Making the disposable bottles, and transporting them, requires a great deal of energy (which contributes to global warming). Their production also generates toxic waste. Discarded bottles may become part of ocean plastic gyres. Barlow says that several municipalities in Canada are banning bottled water. As discussed on last week’s interview with biologist Maricel Maffini, many plastic water bottles contain potent hormone disruptors and carcinogens. See Dr. Peter Gleick’s blog about water issues, including entries on potential water wars, the amount of plastic bottles we use, conserving water, water to grow beef, etc. Dr. Gleick is the president of the Pacific Institute, which focuses much attention on water and sustainability. Rainwater collection, Dr. Caldicott and Barlow agree, is an essential component of water conservation. HarvestH2O.com, “The online rainwater harvesting community,” is devoted to education around this issue. See the May 7 article Harvesting the Rain: An Old Idea Takes on New Life. Rainwater may contain some pollutants but not pharmaceuticals. See Drugs found in drinking water. 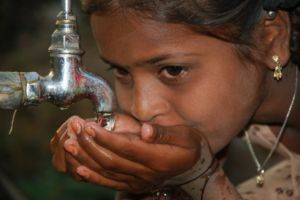 Barlow notes that some societies, such as rural India, are following centuries-old traditions of water conservation and should serve as role models for the more industrialized world which sees water as an unlimited resource. Since the 1950’s, Barlow says, the human population has increased three-fold, but our water use has increased seven-fold. As societies become more “sophisticated” and industrialized, and emulate the consumer-driven culture of the U.S., they use much more water. The water crisis today also involves the world’s oceans, and Barlow recommends the new book, Sea Sick, by Alanna Mitchell. She says we must stop thinking of the oceans as a giant waste dump. Barlow explains in depth why desalination is mostly a bad idea, and why more energy-saving and sustainable practices should be put into place to conserve water. Barlow lays down the five principles of water use and conservation that must be implemented around the world. All the solutions to the water crisis must follow these guidelines. She quotes Martin Luther King Jr. who said that “legislation may not change the heart but it will restrain the heartless.” Read the June 3 article Another Water World Is Possible: Managing World Water which links to Barlow’s 10 recommended foundations for a well-managed water commons. Read the new report written by Barlow, Our Water Commons, Towards a New Freshwater Narrative. Dr. Caldicott in April 2009 at Middlebury College, Vermont, in which she talks about the medical effects of nuclear radiation. In explaining the looming threat posed by nuclear power plants such as Vermont Yankee, she says that most politicians are scientifically illiterate. They do not comprehend the effects of radiation or the causes of global warming. For example, many elected officials think increasing CO2 from the present 387 parts per million (which many scientists says is already beyong the tipping point toward catastrophic climate change) to 550 PPM is acceptable, but in reality such an increase would surely doom the planet. The group Safe Power Vermont wants to shut down Vermont Yankee. 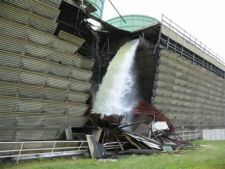 In 2007, one of the plant’s cooling towers, supported by rotting wood, collapsed, and water that should be cooling the reactor core spewed out of the broken plant (see photo by anonymous photographer below). Read the May 14 news article, Residents Forceful: Shut Yankee Nuclear Plant Down. Dr. Caldicott teaches the audience what would happen if Vermont Yankee, near the Massachusetts border, or the Indian Point reactor, 30 miles from New York City, were to melt down, inducing widespread pandemonium, radiation sickness, and death. She mentions a 2004 report, Chernobyl on the Hudson? The Health And Economic Impacts Of A Terrorist Attack At The Indian Point Nuclear Plant, essential reading about a hypothetical meltdown. If the San Onofre plant, north of San Diego, were to melt down, the same dire effects would engulf much of Southern California. As indicated by this aerial photo, San Onofre could easily be flooded and damaged by the projected 30-foot sea level rise from global warming which could spell disaster for all coastal nuclear plants. A meltdown at any of the 100-odd U.S. nuclear reactors could impact millions of people. This speech also reveals what happened to the 600,000 soldiers who were brought in to clean up after the Chernobyl accident, and Dr. Caldicott explains what percentage of Europe is still radioactive, as suggested by this map showing cesium distribution. See How Chernobyl Could Happen Here about the danger of a U.S. plant accident. She gives examples of how a terrorist or other saboteur could easily melt down a nuclear power plant. And plutonium can be stolen from the plants to make nuclear weapons - read about how a New Generation of Nuclear Power Stations ‘Risk Terrorist Anarchy’. Dr. Caldicott makes it clear how atomic energy plants are really “nuclear bombs” in our midst as they could be intentionally melted down to kill hundreds of thousands of people, “cancer factories” because of the cancers caused by both routine radiation releases and accidents, and “bomb factories” since the material processed in the plants is used to make nuclear weapons. This entry was posted on Monday, May 11th, 2009 at 12:00 am	and is filed under Uncategorized. You can follow any responses to this entry through the RSS 2.0 feed. Both comments and pings are currently closed.